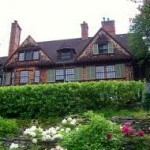 I first fell in love with tree peonies at Naumkeag, the historic Stanford White “cottage” in Stockbridge, Massachusetts which is just down the road from us in the Berkshires. The more elegant and refined relative of the herbaceous peony — that floppy favorite of the springtime garden — the tree peony is known as “mudan” in Chinese and has been an integral part of Chinese culture for over 3,000 years. 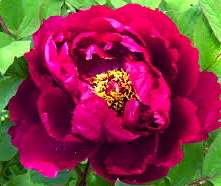 Countless Chinese poems, such as the one above, paintings, and textiles are filled with images of tree peonies. First used for medicinal purposes, the plant became a favorite of the Imperial Garden where new varieties were created through seedlings and grafting. (The word “mudan” means a plant that can reproduce from both seed and sucker). 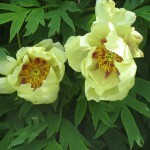 The flowers of the tree peony are larger than their herbaceous cousins, bloom several weeks earlier, and can grow to the size of dinner plates on mature plants. After the flowers have faded, tree peonies are also far more interesting than the herbaceous variety with their deep green fan-like leaves that turn purple and gold in the fall. Once comfortably situated in well-drained soil and dappled sunlight, they can live for centuries. But, in my experience, they take their time getting comfortable. Unlike most perennials which I tend to move about like lawn furniture until I find the right spot, tree peonies get grumpy when forced to relocate. I’ve moved mine twice in the fall, which is the best time to plant them, but the following spring — almost in spite — they’ve refused to bloom. To see these magnificent plants in all their glory pay a visit if you can in late May to Naumkeag, which has over 40 varieties. These tree peonies were brought back from China by Mable Choate, the daughter of the original owner of Naumkeag, who fell in love with them on a trip to Asia in 1936. The garden she created for them, together with the many other “outdoor rooms” at Naumkeag, are the result of a brilliant 30-year collaboration between Mable and the landscape architect Fletcher Steele. Flowing down a steep hill above Stockbridge, Naumkeag’s gardens are thought to represent the first truly modern landscape design in this country. 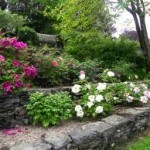 The Trustees of Reservations, which runs Naumkeag, has started an ambitious multi-million dollar renovation of this National Historic Landmark, ensuring that the tree peonies — and this entire 10-acre paradise — will continue to bloom for generations to come. how beautiful are these pix one of your favorite flowers – you’re making it harder and harder to do anything but sit back and enjoy your musings…I’m so pleased to be getting these each week…”keep those cards and letters coming”! The summer sounds like it could be a great one after a slow start! Thanks so much, Annette! I imagine you must be busy in the Central Park gardens now. I’m already falling behind with my planting and weeding and pruning and mulching and fertilizing and … time for a nap! If I recall correctly, I saw my older brother staring at some ants. 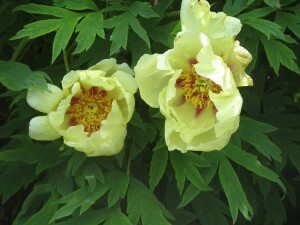 I wonder if you remember the peonies at our house on Edencroft Road? 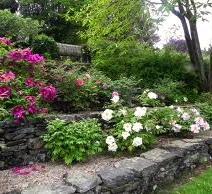 They and an enormous Rose of Sharon were the only real standouts there in terms of plants, but they were magnificent. We drove past the place when we went back for Aunt Eileen’s funeral, and the peonies were gone. It broke my heart. Families come and go. 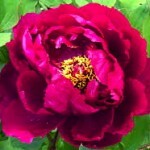 But peonies should last for generations. I have a hard time imagining that someone actually uprooted them, but I can’t imagine what else would have happened. Just wonderful to see and read these blogs! 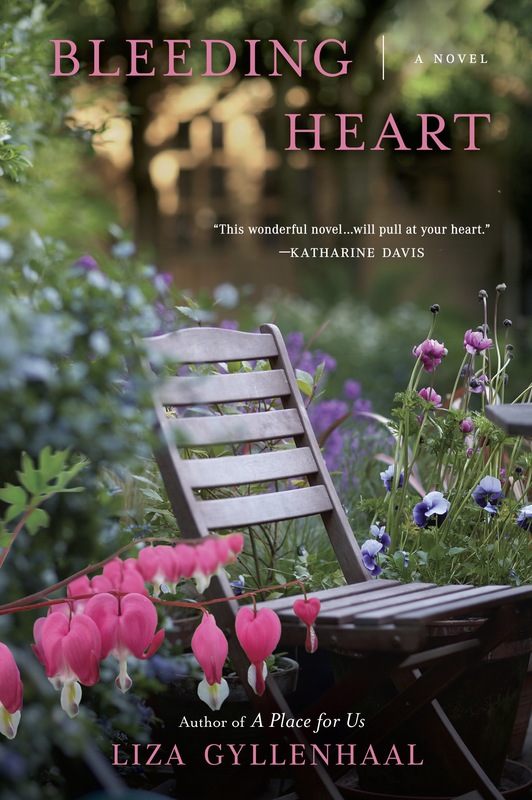 It puts Spring into my heart. Thanks so much, Beata. I love that tree peonies which look so delicate when they bloom can live for centuries — and look more beautiful as they age!